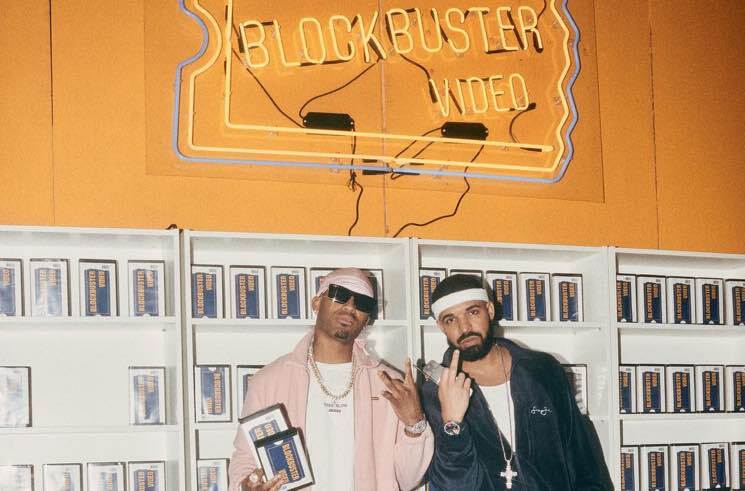 Drake turned 32 yesterday (October 24), and the Toronto rapper celebrated in style — early 2000s style to be exact. The Scorpion rapper welcomed Scorpio season with a bang on Tuesday night (October 23) in Los Angeles, going all out to recreate his youthful years from decades gone by. Toasting the early 2000s, he wore a Sean John tracksuit (with one pant leg rolled up) and carried a flip phone around all night. He later switched up his look, donning an homage to Fabolous in his "Trade It All" video. The party space itself was also decked out, featuring a Blockbuster Video wall, a 7/11 Slurpee machine, Pimp My Ride cars, a recreation of the set of Rap City, airbrushed Drake tees and a Motorola Timeport-shaped cake emblazoned with "Remember when we had timeport with no service." Amongst the famous attendees at the bash were Swizz Beatz, French Montana, Diddy, Chris Brown and Tory Lanez. Kendall Jenner even showed up in a bedazzled Von Dutch trucker hat. If you didn't get an invite, relive the experience vicariously through photos down below. Shirts from #Drake's 2000's bday party tonight in LA.